During the 2018-2019 academic year, Jerry A. Jacobs will be a Fellow at the Center for Advanced Study in the Behavioral Sciences (CASBS) at Stanford University. While at CASBS, Jacobs will undertake a multi-faceted exploration of the future of work, including a case study of technology and elder care. Jacobs has taught several classes on technology and the future of work which have drawn students from the Wharton School as well as Penn's School o Art and Sciences. Jacobs has delivered several presentations in this area. In 2017, he was a Keynote Speaker at the WORK2017 Conference in Turku, Finland. His presentation was entitled "Using History to Inform the Future of Work." 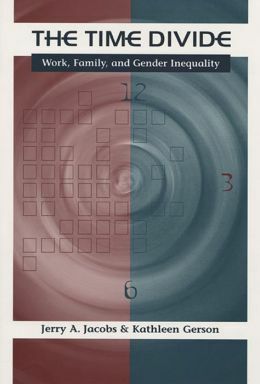 A lecture on similar themes was also presented in August 2017 at a Presidential Thematic Session at the American Sociological Association meetings in Montreal, Canada. Jacobs' lecture, "Will the Robots Take Care of Grandma?" was presented at the Gompers Room at the AFL-CIO Headquarters in Washington DC on June 14, 2018. This presentation was sponsored by the Institute for Women's Policy Research, the J. P. Morgan Chase Foundation and the Mack Institute for Innovation Management at the Wharton School. A podcast of Jacobs' lecture can be found by clicking here on the IWPR website. Research conducted by Jerry A. Jacobs and Kathleen Gerson was the subject of a New York Times article on December 10, 2015. Claire Cain Miller, who writes the "Modern Families" column for the Times, focused her article on Jacobs and Gerson's research on changing attitudes toward the employment of mothers and fathers of young children. Jerry A. Jacobs appeared on Radio Times with Marty Moss-Coane on Monday, December 22, 2014, as part of a discussion of men's and women's labor force participation. Radio Times is a regular feature on WHYY, the Philadelphia affiliate of National Public Radio. Jerry A. Jacobs was quoted in an August 11, 2014 story in Time Magazine that critically assess popular advice on work-family issues. Jerry A. Jacobs received the Worklife Legacy Award at the June 2014 meetings of the Work and Family Researchers Network in New York. The Award recognized Jacobs’ scholarly and organizational contributions to the work-family field. The Work and Family Researchers Network (WFRN) is holding its third biennial meeting in Washington DC on June 22-25, 2016. Jerry A. Jacobs helped to plan the meetings, in his roles as Executive Officer of WFRN and as a member of the 2016 WFRN Program Committee. The meetings were very successful, building on the momentum created at the 2012 and 2014 meeting. Over 700 participants from 42 countries are expected to participate. New features of the 2016 include a Congressional Briefing, "Congressional Education Policy Day," and a newly reworked "Practitioner Day." Jerry A. Jacobs has lectured on interdisciplinarity in Germany (in 2016) at the University of Kassel and at Hamburg University. In March, 2018, he delivered a presentation on "Specialization in Biomedical Research" at the Centre Alexandre Koyre in Paris France. 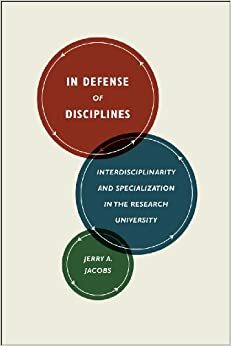 Jerry A. Jacob's book, In Defense of Disciplines has been featured in five "Author Meets Critics" sessions: at the American Sociological Association Meetings (August 2015, Chicago), the Southern Sociological Society Meetings (March 2015, New Orleans), the Social Science History Association Meetings (November 2014, Toronto), the Association for Integrative Studies Meetings at Michigan State University (October 2014), and the Eastern Sociological Society Meetings (February 2014, Baltimore). The Chronicle of Higher Education featured an essay by Jerry A. Jacobs entitled “Why the Disciplines Still Matter in its “Commentary” section on May 27, 2014. Books--Please click on the cover for more information.